What Do Thai Buddhist Monks Eat For Their Daily Meal? The answer to the questions about Thai Buddhist Monks, and what they eat, will vary depending on who you ask, and what country you are in when you ask. 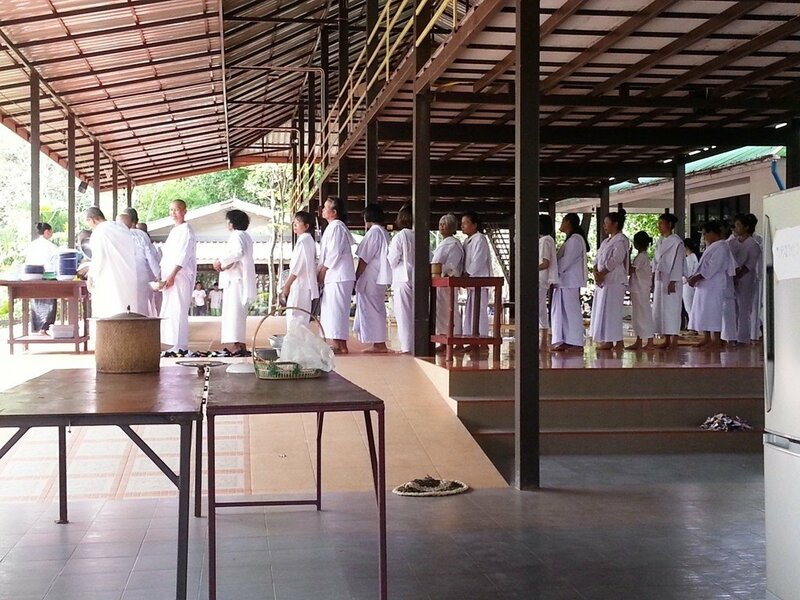 In Thailand, there are may customs and guidelines but these vary for each individual temple or monastery. In this article I will not attempt to go into detail of all the various traditions but instead I will concentrate primarily on my own experiences. This is my experience after walking and eating with the local monastery, just south of the village of Khok Prong, in the Phetchabun province of Northern Thailand. Although Pha Ajhan, the head teacher at the monastery, is vegetarian and recommends a vegetarian diet, he does not impose it on his fellow monks and congregation. He believes that all life is sacred. The congregation respects this belief and even a mosquito is safe at the temple. Measures may be taken to stop them from breading, but once life exists, then it should not be taken. Something that must be considered when discussing what a monk eats, is the teaching of Buddha that it is not right for a monk to refuse food that he is given. So how do they blend these two teachings. There are a few forbidden meats such as elephant, tiger, snake and dog, but if someone offers a monk chicken, pork fish or even rat, they should not refuse this gift. In the local forest monastery, this problem is overcome in a simple and logical manner. 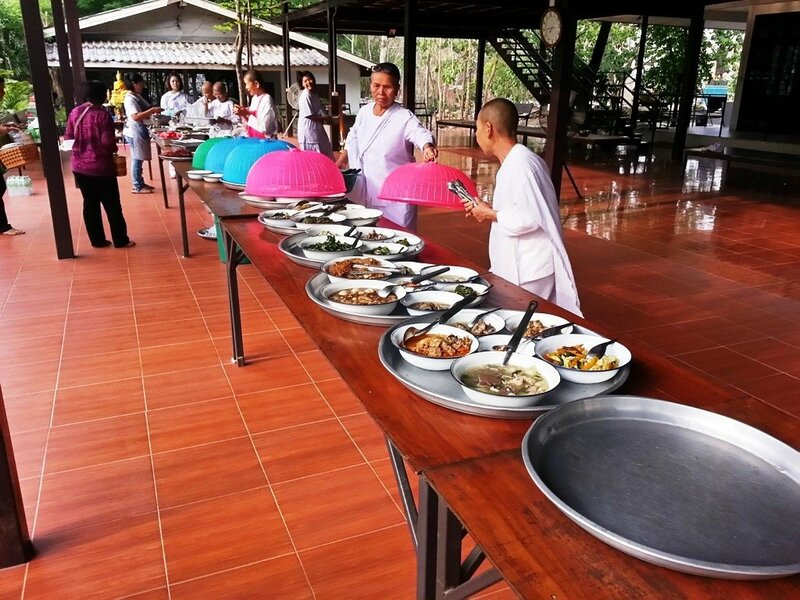 All the food that is collected on the morning walk through the village, (see previous article on Pindapata and Buddhist Monks), is taken back to the monastery. It is then pooled and shared. A monk is then free to select what he wishes to eat and fill his bowl for his daily meal. There are a few other rules that also need to be considered when discussing what a monk eats. The two main considerations are: Monks are not to cook their own food. They must not eat after midday. Food not eaten before midday must be either given away to the poor, used to feed the temple dogs and cats, or thrown out. 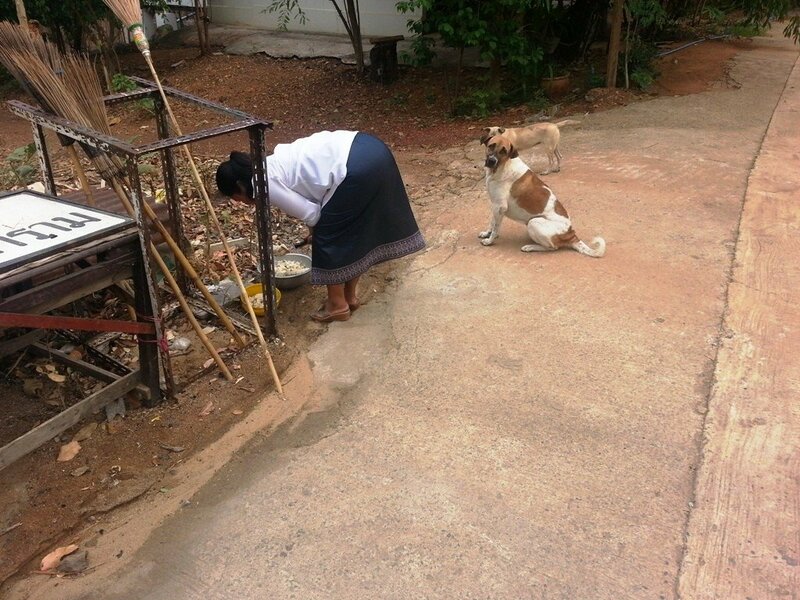 The issue of temple dogs and cats is another subject that justifies a full post of its’ own. Sometimes you will see a monk walking alone. In this case, he will be very dependant on what he is given by the people of the local village. 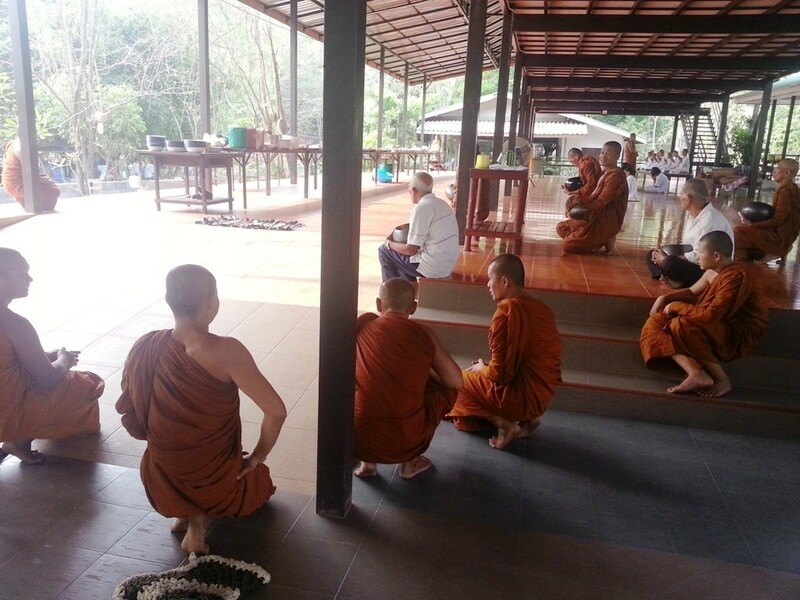 The monetary where I walk, has about 17 monks that walk the streets of the two closest villages each morning. This provides an ample variety of nutritious and tasty food for them to share. This is also supplemented by food that is taken to the monastery by the local village people. The ladies from the local village arrive early in the morning to cook additional food, plus reheat or recook the food that was given to the monks on their morning rounds. 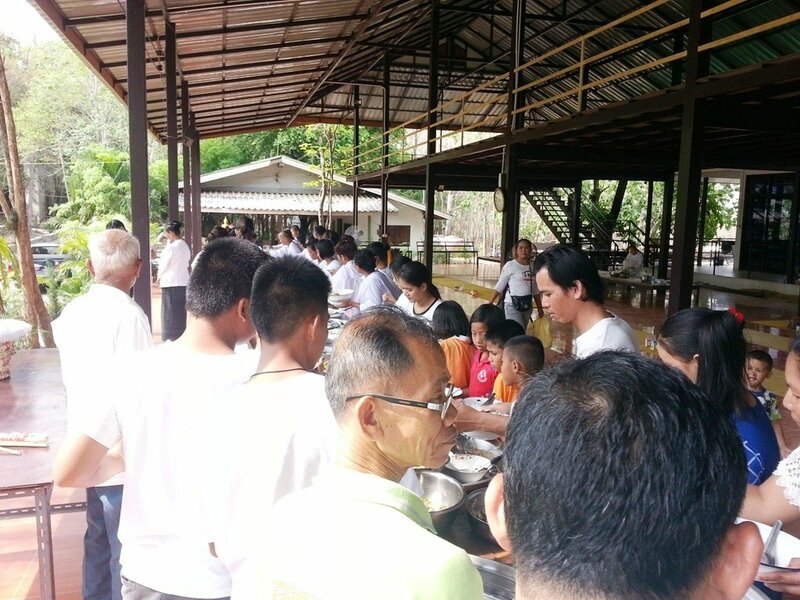 In this way they are still abiding by the guidelines as they are not cooking themselves and all food is donated either on the morning walk or directly delivered to the temple by the laypeople. The sequence of events for the preparation of the daily meal is laid out below in a series of photographs. 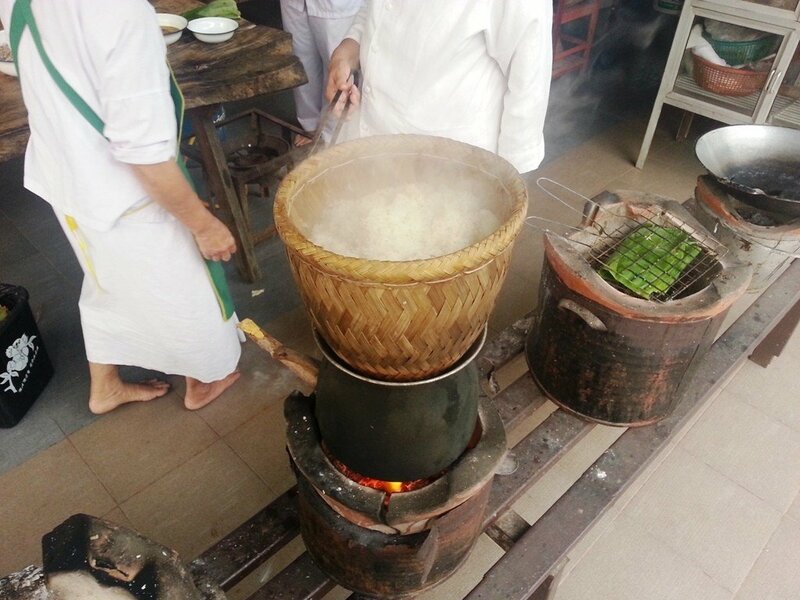 As with most Thais, rice is a main ingredient at each meal This image shows rice being steamed on a traditional outdoor wood fired bucket BBQ. On the second BBQ is sticky rice and banana wrapped in banana leaf. 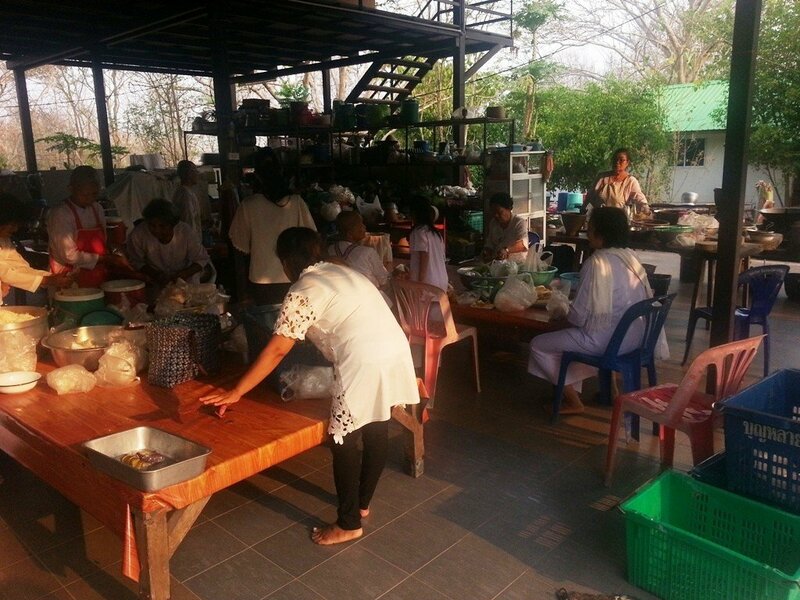 The nuns and ladies from the village prepare the buffet style meal ready for the arrival of the monks. At this stage they have completed their morning walk and are attending a short worship before they eat. 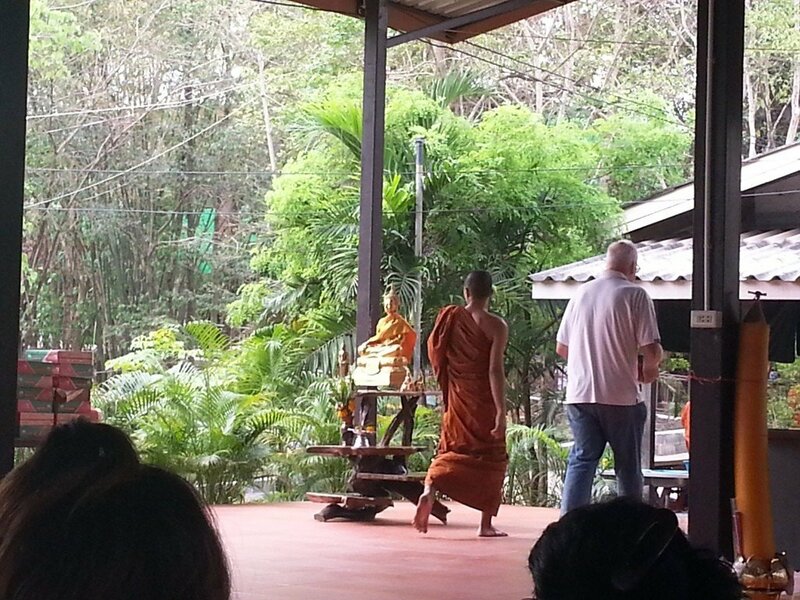 As the Phra Ajahn arrives, all kneel in respect. They all stand again once he starts to select his meal. 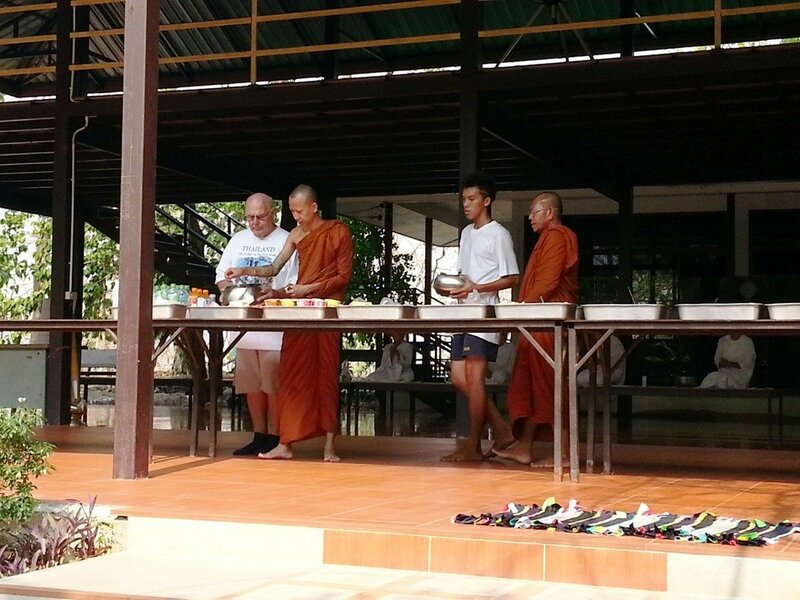 While the monks select their food, the ladies sit with hands together. (well there are always exceptions). The nuns are on an elevated platform. 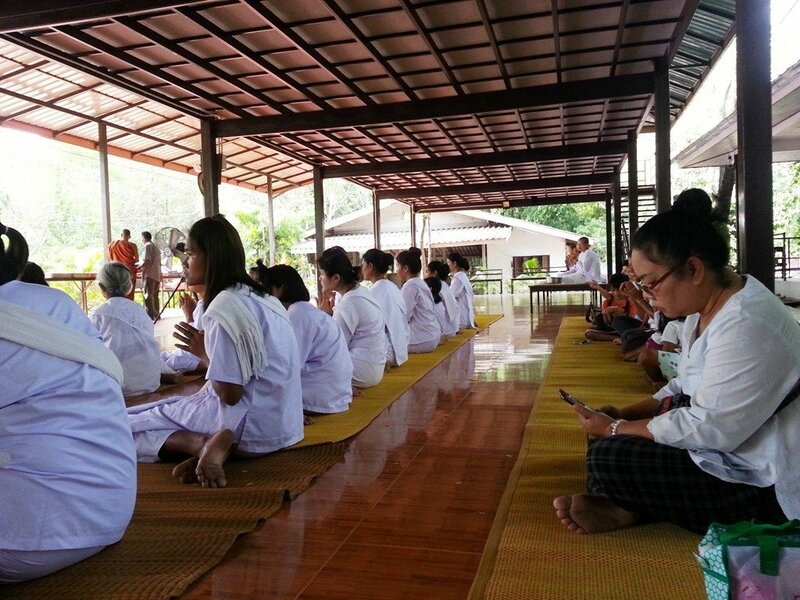 The ladies dressed in white that slept at the temple sit in the front rows. It is common for a monk to have someone to help by carrying his bowl for him as he selects his food. However is is less common to see a western visitor carry the bowl. After the bowl is full, it is carried to the temple where the monk will eat. If the monk has a helper, the helper normally carries the bowl. If you would like to actually experience walking with the monks, and eating what they eat, send us a message and we will start to organize it for you.